Thanks for the suggestion! I didn’t know him! Thank you so much for posting this. I definitely plan to buy the book next week! It is great to know what inspires you; I hope you do that more often! Craig – will be attending stumptown comics fest this weekend and signing for CBLDF again? wow great interview, i imagine you´re an expert after going through hundreds of them yourself . on the other hand, it´s interesting that we can get information not only about blutch (from the answers) but also about you (from the questions), it´s perfect! Paul, unfortunately I’ll be out of town while the Stumptown show is happening in Portland. Though I do recommend the event! 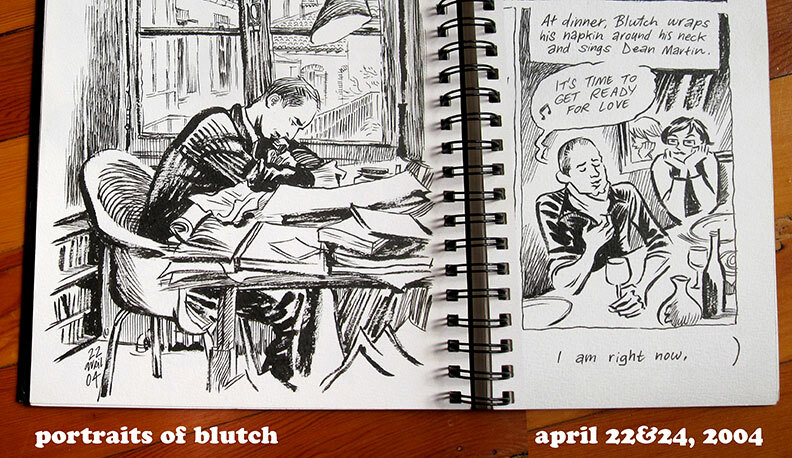 All right, all right–I’ll get some Blutch, already. Sheesh! Craig, did you trim that sketchbook down? The rightside seems narrower than the other? Nicole, I merged two photos to fit them on the blog, but it turned out looking like an asymmetrical sketchbook! Hey you , nice souvenir of Angoulême 2005 ! !